The save came first, a pickup at the goal line of a shot from Islanders defenseman Ryan Pulock. Next was the Herculean backcheck, an end-to-end sprint that interrupted a Mathew Barzal breakaway. 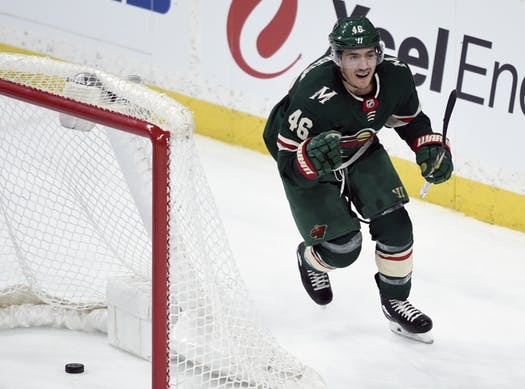 And lastly was the goal, on the power play in the third period, to help the Wild secure a valuable point in a 3-2 overtime loss to the Islanders Sunday at Xcel Energy Center. Call it the Jared Spurgeon hat trick. Spurgeon was dynamic for the Wild, helping set a relentless tone that was encouraging for the team as it finished off a busy weekend with the second half of a back-to-back. But making his presence known all over the ice isn’t new for him. It’s not unusual for him to swoop in and play goalie, but his stop on Pulock was especially timely since it was so early in the game. His hustle to break up the Barzal chance is another example of how strong of a skater he is, an asset to his defending style. And chipping in on offense this season has become the norm for Spurgeon, whose 14 goals are a career-high. He also scored Saturday in the 5-2 win over the Rangers. Spurgeon didn’t have the only standout performance of the game. Winger Ryan Donato finished off a strong weekend by assisting on both of the Wild’s goals after subbing in for winger Kevin Fiala on the team’s first power play unit – this after Donato scored a pair of goals Saturday. This game him back-to-back multi-point games for the first time in his career, and Donato leads NHL rookies in scoring since Feb.21 with 13 points in 13 games. He also had a goal disallowed, as the Islanders successfully challenged for goaltender interference early in the second after Donato’s backhander leaked through goalie Thomas Greiss. But the non-goal still seemed to help the Wild, giving it proof that it could solve Greiss and the stingy Islanders defense. Failing to capitalize on four power plays usually means an ineffective night for special teams, but the Wild still converted twice to help it push the game to overtime. The Wild also accumulated an impressive 69 shot attempts after totaling 75 the night before in the win over the Rangers, well above what the team’s average was entering play (46). “Our forwards did a good job of getting into their guys and creating some traffic in front and giving us some space up top to get pucks down there,” defenseman Ryan Suter said.